Today I urge you to try something different in your journal. What is different is different for each of you, of course, but if you usually use acrylic paint, try watercolor or colored pencils; if you usually do a lot of writing, make a page of just color; if you often make sketches, try an abstract painting page. Grab a magazine (“O” magazine and National Geographic have wonderful images, and no, it’s not against the law to tear up an old National Geographic magazine!) or newspaper or advertisement. If you like some of the image, tear the paper so that the image is visible. Or, don’t worry at all about image and just go for color. You can use scraps of scrapbooking paper, or gift wrap. Also you can use crumpled tissue paper. Or, just tear up some paper in small pieces, about 1-3 inches in size. Tear up 5-15 pieces. If all you have is a glue stick, use that. If you have matte medium, use that. If you have white glue (like Elmer’s glue), pour a little into a bowl, add the same amount of water, and use that. Stick your pieces down in a way that pleases you, but don’t let yourself get paralyzed by it. If you can’t decide how to place your pieces in an artistic manner, place them in the way you’d expect a 5 year old to place them: anywhere on the page. After you glue them all down, go over the whole page and brush it all with the glue or matte medium. Be generous with the glue. If you’re using glue stick, just go over the whole page generously. Go have a cup of tea and let it all dry. Be sure to wash out your brush! Now you have a lot of choices. You basically have a very textured page, and you can decide whether to highlight some of the images, or to cover them lightly or heavily with paint. You can also stop at this point, and call the page done! For me, if the actual images are not important, I like to paint the page with diluted white paint or white gesso. That way the colors are toned down, but still show through a little bit. You could also then use the page as if it were a blank page, and do whatever you would ordinarily do in your journal on top of this highly textured background. I like to write out a poem or quote on top of a collage. Sometimes it takes some risk and experimentation to find ways to express our soul out into the world. Trying new things in a journal is a way to rehearse risk and experimentation without fear of ruining anything. More often than not it becomes a new happy discovery which helps us overcome our natural fears of experimentation in other arenas. It can help us rehearse how to live our lives with more openness and curiousity. Soul loves this kind of play and expression. Enjoy! 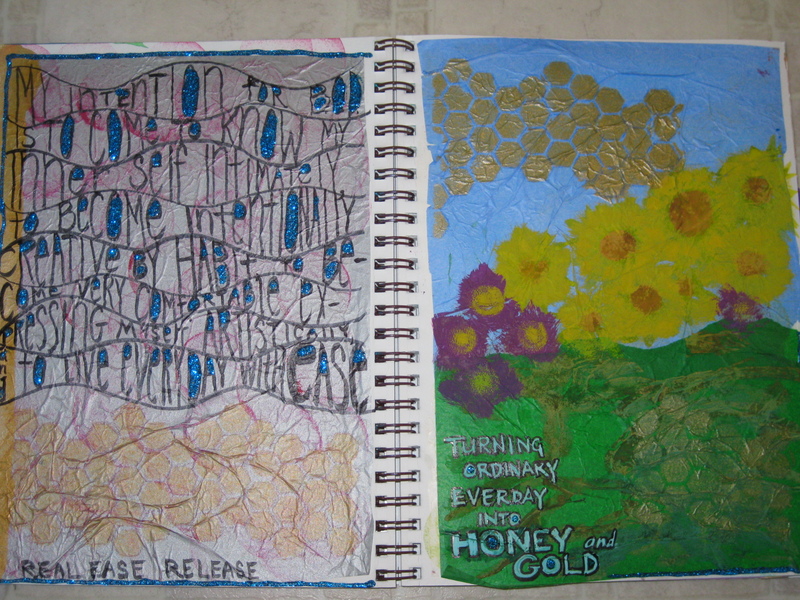 Day 32 of a series of daily prompts for written, visual, or art journalling, or just for pondering. For more background information, see the Intro pagehttps://catcharissage.com/2014/10/29/announcing-sixty-days-of-visual-journalling-prompts/, or this post on visual journalling: https://catcharissage.com/2014/07/12/talking-about-journals/.